So, are you ready to saddle up and ride out on Rockstar's latest western adventure? Here's what you need to know before you hit the dusty trail of Red Dead Redemption 2 on PS4 and Xbox One. When can you play Red Dead Redemption 2 on console? Right now! Red Dead Redemption 2 is available on PS4 and Xbox One. How much did Red Dead Redemption 2 on console make during opening weekend? According to Forbes, Red Dead Redemption 2 on console had a record-setting $725 million launch weekend -making it the second biggest earning opening weekend for a game (second only to GTA V). Is Red Dead Redemption 2 coming to PC? It looks likely that we will see Red Dead Redemption 2 on PC, however Rockstar Games has not officially confirmed if or when this will happen. Just how good is Red Dead Redemption 2? Over the past few years, I’d argue the only games that deserve to be considered at this same ultra elite level are GTA 5, Metal Gear Solid 5, and The Witcher 3. This is a stone cold 5/5 classic that combines brilliant writing – Rockstar’s Houser brothers deliver another affecting, scythe-sharp script – amazing tech, and one of the most boldly structured plots to ever grace a triple-A title. The story is so well told, you’ll emotionally invest more in a horse during one crucial scene than you did even for Kratos in this year’s stellar God of War revival. If you only buy one game this year, it absolutely has to be this wondrous Wild West quest. This game has heart; the kind of heart that is difficult to pin down but impossible to deny. It is a wonderful story about terrible people, and a vivacious, tremendously sad tribute to nature itself. There is so much beauty and joy in this expensive, exhausting thing. Somehow that makes it even more perfect – a breathtaking eulogy for a ruined world, created by, about, and for a society that ruined it. There can be no doubt that this is a landmark game. It is a new high water-mark for lifelike video game worlds, certainly, but that world is also home to a narrative portrait of the wild west that is unexpectedly sombre and not afraid to take its time. With very few exceptions, the many stories that Rockstar’s writers have set out to tell about this group of outlaws land perfectly, the enjoyable twists and turns of individual missions and chapters feeding into an exciting, sophisticated and absorbing larger narrative – and the stories that you discover yourself within its world are no less compelling. Set in Rockstar’s most authentic and lived-in open world ever, there are so many things to do, so many people to meet, and so many places to explore it’s giddily overwhelming. Red Dead Redemption 2 isn’t just Rockstar’s greatest achievement to date; it’s a game so lacking in compromise it’s tough to know where best to start discussing it. It's been eight years since the last Red Dead Redemption, and five since the release of Grand Theft Auto 5 - time that you can see and feel in every delicately crafted inch of a game of this scope and scale, yet time in which we've been spoilt by the likes of The Witcher 3 and The Legend of Zelda: Breath of the Wild. Rockstar's writers can't quite match the humanity and purpose of the former, nor can its designers match the integrity of the latter. It offers something else besides, though: a richness, detail and technical prowess that is breathtaking, and peerless. Is this Rockstar's greatest game, a new masterpiece alongside the original? There are one too many caveats, and one too many flaws at its heart, to leave me totally convinced. Is this its richest, most beautiful open world? Of that there's not a single doubt. While Red Dead Redemption was mostly focused on John Marston's story, Red Dead 2 is about the entire Van der Linde gang--as a community, as an idea, and as the death rattle of the Wild West. It is about Arthur, too, but as the lens through which you view the gang, his very personal, very messy story supports a larger tale. Some frustrating systems and a predictable mission structure end up serving that story well, though it does take patience to get through them and understand why. Red Dead Redemption 2 is an excellent prequel, but it's also an emotional, thought-provoking story in its own right, and it's a world that is hard to leave when it's done. But what about a PC version? So far, there's been no official word from Rockstar on a Red Dead Redemption 2 PC outing, with only the console versions so far announced. However, we saw a similar story with the release of Grand Theft Auto V. A roaring success on PlayStation 3 and Xbox 360, it was several years before it made the jump to the PC, and eventually even crossed console generations with a remastered version of the game turning up on PS4 and Xbox One. Could it be a similar story for Red Dead 2? It's looking likely – the LinkedIn profile of a programmer with previous experience at RockStar shows that the employee has been working on the game from a PC standpoint, with the profile verified by several sources. We'd say a PC version is incredibly likely at some point: indeed, a retail listing has leaked out early suggesting a 2019 PC launch is on the cards. Meanwhile, Red Dead Online is currently in beta testing on PS4 and Xbox One. 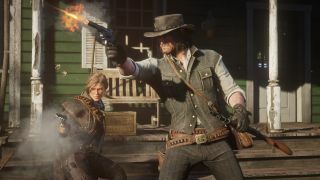 In an interview with Vulture, Rockstar Games co-founder Dan Houser estimated that Red Dead Redemption 2 will take player 65 hours to finish. In addition, Houser revealed the title spans 2,000 pages of script, makes use of 300,000 animations and 500,000 lines of dialogue, and Rockstar employed 1,200 actors for motion-capture work – 700 of whom also recorded dialogue. You can now interact with citizens in a way you couldn't before. From calling out to fellow riders to talking your way out of trouble with the sheriff, your actions have consequences. It's up to you whether you choose to escalate or diffuse volatile situations, but negative actions could result in making enemies. Due to the Van Der Linde gang not being the friendliest neighbors, you'll often be forced out of an area and have to set up camp somewhere new. Camp serves as your gang's base, it's where you eat, sleep, play games, and perform chores. You need to pull your weight, fetching food and supplies to keep morale high. You can also take part in activities for fellow gang members which improve your relationship with them. With the open world deeper than ever before, there are plenty of different regions for you to explore including sprawling forests, scorching deserts, bustling cities, sheer mountains and mucky swamps. These areas are inhabited by appropriate wildlife, with alligators roaming the swamps and eagles circling mountain tops. Each weapon has a unique characteristic and is valuable in different situations. You can customize each weapon down to the material used to craft the weapon and what type of ammunition each gun holds. You also need to keep your weapons maintained, but if you use the same weapon long enough you'll become more efficient and effective with it. Before heading into combat, you need to stock up on the right weapons - your mobile arsenal will be carried around by your horse but you can only hold so many weapons at one time. Choices include the Cattleman Revolver and Springfield Rifle, as well as the more potent Sawed-off Shotgun and Volcanic Pistol that you'll need for close quarters combat. For hunting, you'll want to use the Varmint Rifle to keep hides free from big bullet holes, and the Double-Action Revolver makes a good riding companion due to its quick firing speeds. Speaking of quick firing speeds, Dead Eye mode is back and more brutal than ever. As you progress, your relationship with your valiant steed will blossom. The stronger the bond, the easier the horse is to control. There are also a wider variety of horses than before, with each horse having a specific purpose (such as racing). There's mention of "the sons of Dutch" in the third trailer, and while this is more than likely a reference to the familial nature of the Van Der Linde gang, is there a possibility Arthur Morgan could be Dutch's progeny? As you'd expect of a Rockstar game, Red Dead Redemption 2's vast open game world is the backdrop to a thrilling single-player campaign. Though the first game followed the story of one man, that's not the the case with Red Dead Redemption 2. One similarity we do know Red Dead Redemption 2 will have to Grand Theft Auto 5 is its huge online multiplayer world. On the game's website, Rockstar has stated that the world of the single player campaign will "also provide the foundation for a brand new online multiplayer experience."